Destinations.... What a universal and inspiring theme!! I was born and raised in Texas and in 1997 moved to Colorado with my husband and children. Its hard for a Texan to leave, but honestly, we were moving to an amazing place!! Estes Park, Colorado is the gateway to Rocky Mountain National Park. Who could complain about living in such a wonderland? Still, my heart has always been torn and tugged between two places I loved. “Destinations” gave me a pondering place to consider destinations not as a distant place but rather a place to return. Destination: home. I think all of us who have followed Tim's blog have been inspired and amazed (and exhausted!!) by his journaling of his travels. But we are also touched by the sweetness of the pictures and messaging of the touchdown home. But where is home, really? This Vintage Journey helped me explore that. Journey with me….. 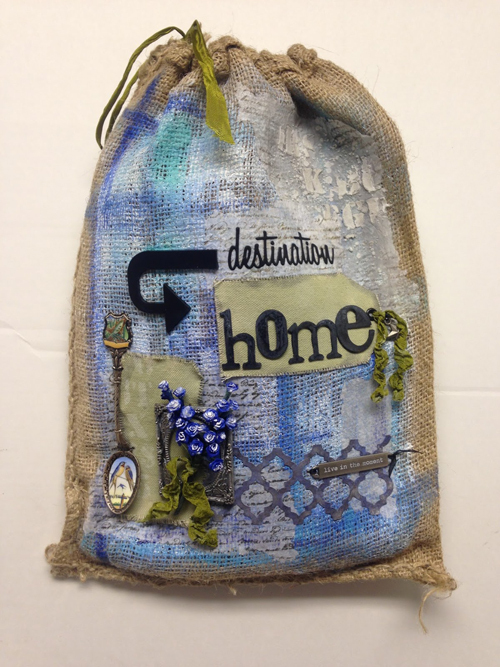 I wanted to create a sort of hobo bag to collect ephemera that represent "home" to me. 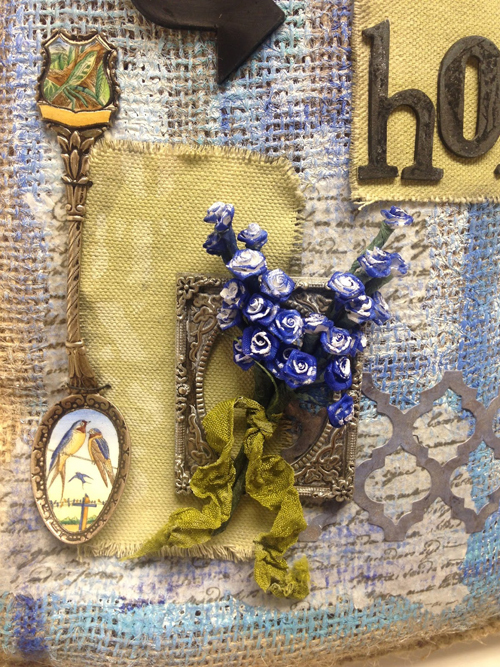 A place to collect maps and clippings, pinecones and bluebonnet seed packets, pictures and lyrics. I headed to my trusty ready-to-be-altered stash and grabbed this burlap bag that had contained an inner plastic bag of flour. Gorgeous packing for spelt, no? 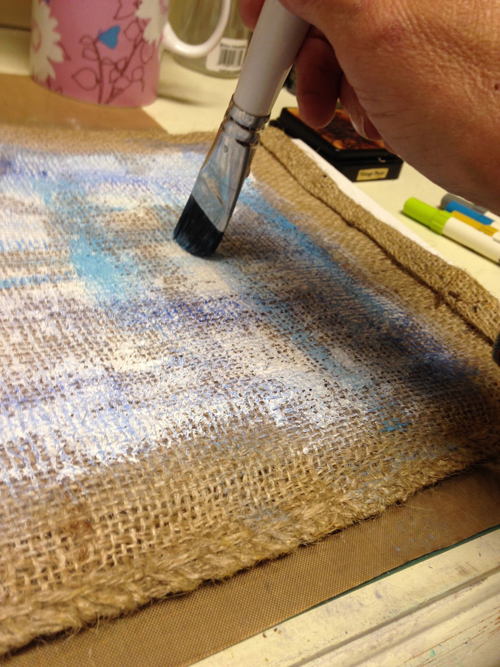 I gave the bag a foundation of gesso and then crosshatched a range of blues from Dina Wakley's Media paints: Lapis, Turquoise, Sky, and White. I start with the darkest color, lapis, knowing that the next layers will cover and that the darker paint will peak through. I added progressively lighter colors and then dry brushed the darker lapis at the very end, just adding touches where they were needed. 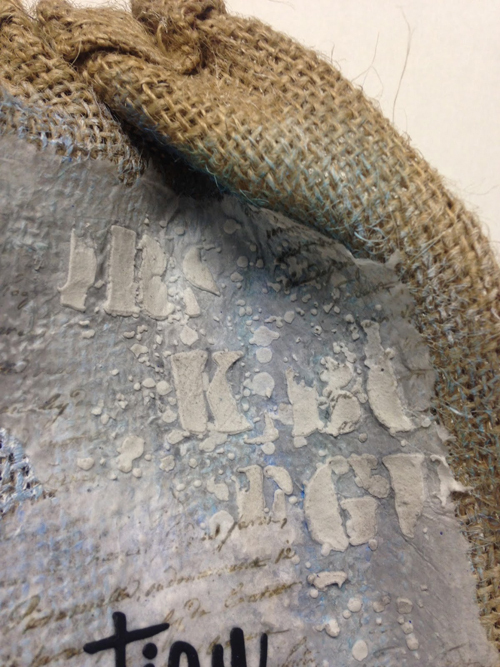 The embossing paste got a wash of Hickory Smoke Distress Paint thinned down with water to tone it down a bit. 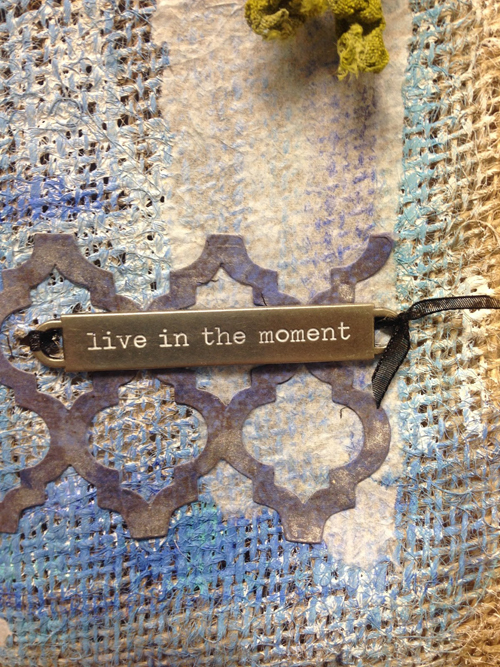 I have some tags I've cut out of heavy rescued canvas and painted them here with Old Paper Distress Paint. Over that, I stitched down a gorgeous spoon made in Czechoslovakia I picked up at a yard sale. It has tiny enamel images of birds and has been living on my desk for the longest time, patiently waiting to be added to some art! Colorado has such an amazing variety of ever present birds that sing to us constantly. Very faintly on the tag you can see the letters T, X and S, just how they appear on the stencil. In this wider shot, you can see the tissue paper strips layered and crosshatched as a foundation for my embellishments. 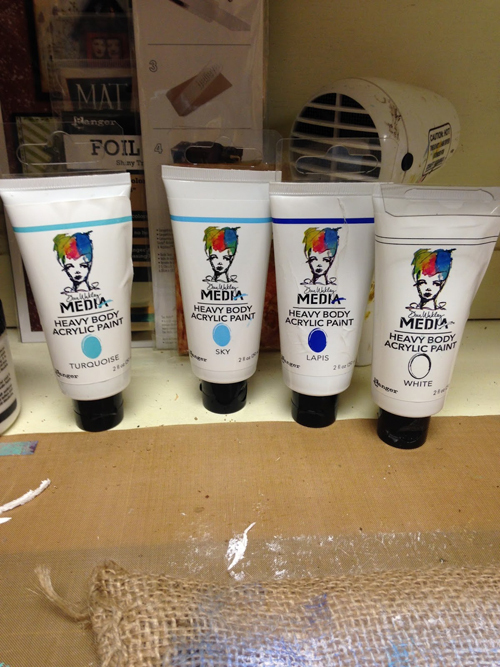 I've used Tim's Foundry Frame (LOVE!!!) here to frame my "bluebonnets". 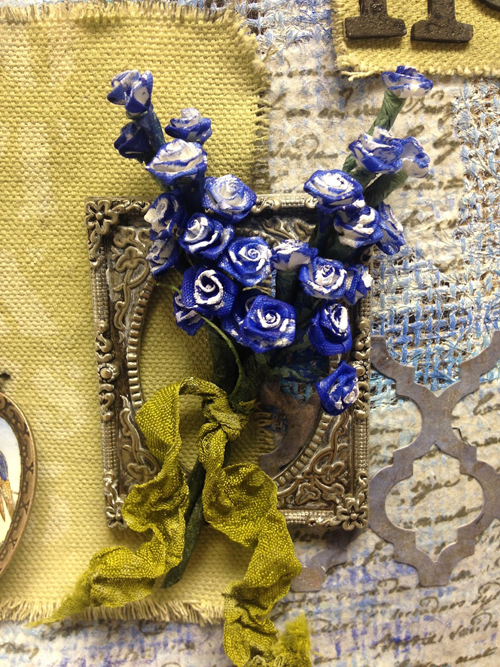 These are tiny ribbon roses I painted with Dina's Media paint in lapis and a kiss of white, and then wrapped them with floral tape to create bluebonnets. The Foundry Frame got a rub of white paint for distress. It is also stitched down with waxed linen and the stitches are hidden by the flowers and the ribbon at top and bottom. 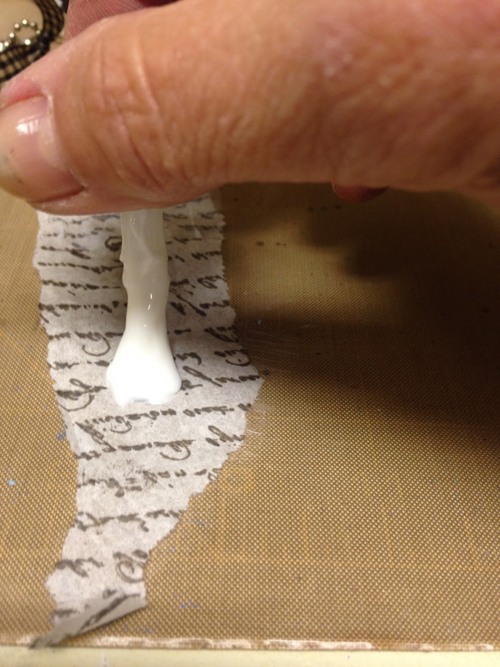 More tissue paper layers, a Trellis On-the-Edge die from Professor Holtz, cut out of Wallflower Paper Stash scrap, painted lapis and then just finger touched with Brushed Pewter Distress Spray Stain. The word band reminds me not to yearn and long for some other place, but to look around me and find my home in the hearts of those around me, in the everyday beauty found almost anywhere and to live in the moment. This moment can be home. Word Play Alterations die, and Alpha Parts Framed arrow. I always love the texture of hessian / burlap and love using it in my projects too but this fabulous sack is a stunner and to have one altered in this way would be wonderful. Thank you so much Cheryl for joining us and sharing such a great project and your process steps with us. I have a small hessian pouch sitting on my windowsill in a pile of bits and now you have inspired me to have a go at making it into a cover for something. Ooooh I love it when I get excited to create and can't wait to get going. Thank you all for stopping by to see our very gifted guest and please go take a look at Cheryl's fabulous blog and leave her some love. Our July challenge is still open with a theme of Destinations chosen by Nikki and being hosted by Jenny and we have some fabulous entries for you to take a look at as well as the Creative Guide inspiration pieces. We will also be back on Monday with Terminal 4 of our Destination Inspiration articles. Such an amazing project Cheryl, and such a great post! I love all the thoughts behind it, and the message you convey is so true! The finished result of that fabulous bag is just stunning, the blues in the background with those gorgeous blue bonnets are so eye catching, the whole project is just inspiring from beginning to end! Thanks so much for joining us here on AVJ with such a fantastic project! Cheryl I enjoyed reading about you, your inspiration and journeys and how you created your destination sack. So many loving details. 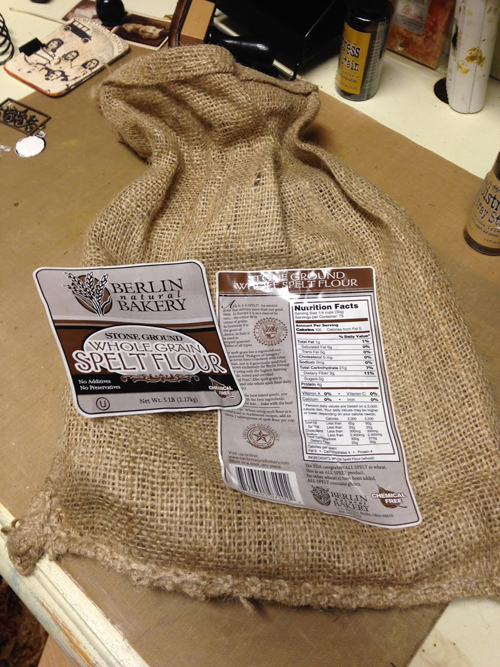 I think I may have a burlap bag hiding in my stash. Maybe I should take a look. Always love a good repurposing project and this one is amazing!!! Love the layers and imagery. Such an inspiring post! I have learned so much... Thank you for sharing this with us! A wonderful post Cheryl full of inspiration. Lovely to see your process and how your creative mind works as you craft. Ahhh - what a wonderful post to read Cheryl. I'm in Texas so I understand your sentiment a bit! Your bluebonnets are so fun - made me smile. 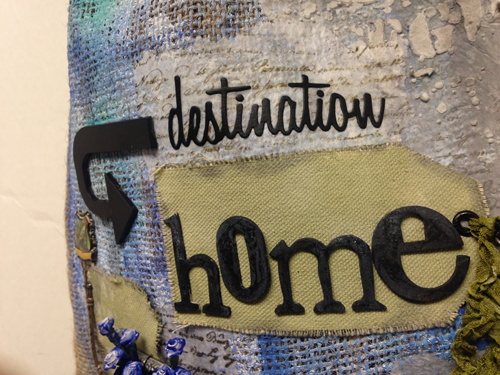 FABULOUS project... love the thought of putting things in your burlap bag that are "home". Very creative and definitely inspiring. j.
Cheryl, your post is one that starts the mind pondering. I love your burlap sack and the way you altered it....it will be a fabulous place to collect little treasures and memories. You inspire me...Fabulous piece! Cheryl, your guest designer piece is so lovely and your words to describe your thoughts in putting this lovely piece together. Such a wonderful creative journey! Your words are almost like a poem as you describe your inspiration and how you thought out each element you added. 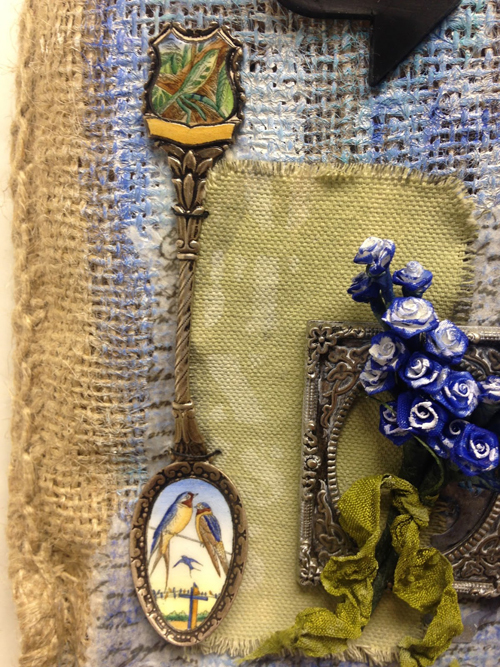 It is such a lovely burlap bag with so many artsy and lovely details. Beautiful job!!! AWESOME!!!! Love the use of the bag, and what a transformation! So great to see Cheryl here! Lovely alteration...the burst of blue, the flowers and the frame makes this no ordinary bag! Just beautiful. Yay and welcome Cheryl! It is so nice to have you as a guest at AVJ and sharing your beautiful burlap bag! I can certainly understand you love of both Texas and Colorado as home really is where the heart is and that can be in more than one place! Love this, Hugs! Wonderful project Cheryl and love to hear your thoughts as you created this wonderful bag,thanks so much for sharing and congratulations on being chosen as a guest designer here at AVJ!